I'm Running to Eat! : A Lasagna Sandwich? 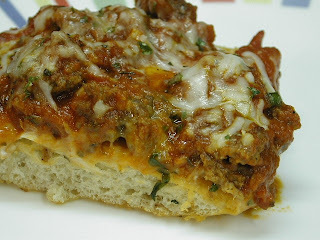 I knew this one was going to be a hit as soon as I saw the recipe for Garlic Toasted Open Faced Lasagna Ciabattas over at The Picky Palate. Okay. Maybe it was as soon as I saw all the mouth-wateringly yummy photos, but once I scanned the recipe I knew it was soon to become a family favorite and I was right. I was disappointed that our Super Walmart didn't have the ciabatta rolls, but they did have individual-sized foccacia, which substituted perfectly. Quick to make, this recipe includes ingredients everyone loves. Even the picky ds ate his without complaining. (Shhh! Don't tell him it really isn't pizza!) Served with a salad on the side, this was a delicious and filling meal. 1. Preheat oven to 375 degrees F. Place oil into a medium dutch oven or pot over medium heat. Cook sausage until browned, about 5-7 minutes; reserve ¼ Cup of sausage for ricotta. Reduce heat to low and stir in pasta sauce and basil leaves. Simmer for 15 minutes. 2. Place reserved ¼ Cup sausage, ricotta, parmesan, mozzarella, salt, pepper and Italian Seasoning into a medium bowl. Stir to combine. 3. Split each ciabatta roll and place cut side up onto a large baking sheet. Spread ricotta mixture over each roll, about ¼ Cup (*you probably won't use all of ricotta.). Top with a couple spoonfuls of pasta sauce, and fresh mozzarella cheese. 4. Bake for 10-12 minutes or until cheese is melted and hot. Remove, sprinkle with parmesan cheese and serve. *If you don't use all of your ricotta, save it and use it in a pasta dish for later in the week. I made a baked pasta dish where I stuffed the ricotta in the middle of some penne with red sauce, it was great.